Following the death of her parents, the book’s heroine, Flora Poste, finds she is possessed “of every art and grace save that of earning her own living.” She decides to take advantage of the fact that “no limits are set, either by society or one’s own conscience, to the amount one may impose on one’s relatives”, and settles on visiting her distant relatives at the isolated Cold Comfort Farm in the fictional village of Howling in Sussex. The inhabitants of the farm – Aunt Ada Doom, the Starkadders, and their extended family and workers – feel obligated to take her in to atone for an unspecified wrong once done to her father. As is typical in a certain genre of romantic 19th-century and early 20th-century literature, each of the farm’s inhabitants has some long-festering emotional problem caused by ignorance, hatred, or fear, and the farm is badly run. Flora, being a level-headed, urban woman, determines that she must apply modern common sense to their problems and help them adapt to the 20th century. 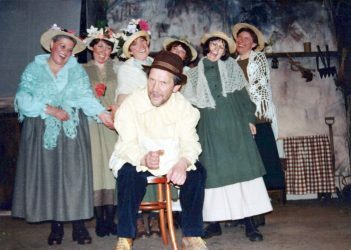 The action of the play takes place in and around Cold Comfort Farm, near Howling, Sussex in the 1920’s. 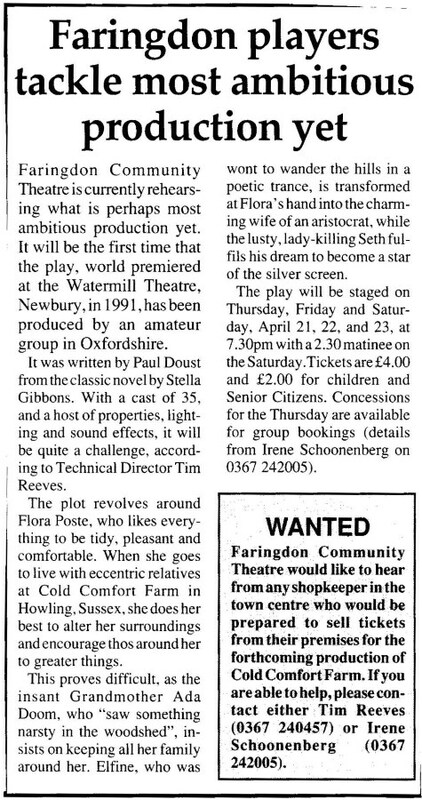 It will be the first time that this play, world premiered at the Watermill Theatre, Newbury, in 199l, has been produced by an amateur group in Oxfordshire. Also joining us on stage were some members of the Impetus School of Dancing, Swindon.